Bangkok (AFP) - The hunt for a group behind the Bangkok shrine blast narrowed Monday as police revealed they had two new suspects -- one of whom told AFP she was innocent and living in Turkey. Two weeks after the unprecedented bombing at the Erawan shrine brought carnage to the city's commercial centre, killing 20 people in Thailand's worst single mass-casualty attack, the motive for the blast remains shrouded in mystery. Suspicion over the August 17 attack has alternated between Thailand's bitter political rivals, organised criminal gangs, Islamist militants, rebels in the kingdom's strife-torn south and sympathisers of refugees from China's Uighur minority. Police are now seeking a Thai woman and an unidentified man after bomb-making materials were discovered over the weekend in an apartment in the suburb of Minburi. Investigators believe it was used as a hideout by the network that carried out the attack. "We found fertiliser bags, watches, radio controls -- parts to make bombs and electric charges," said national police spokesman Prawut Thavornsiri. "We are confident they are the same group." Police had detained an unidentified foreign man on Saturday morning at another flat nearby, where detonators, industrial pipes and ball bearings were found. Dozens of fake Turkish passports were also found in his flat, police added. 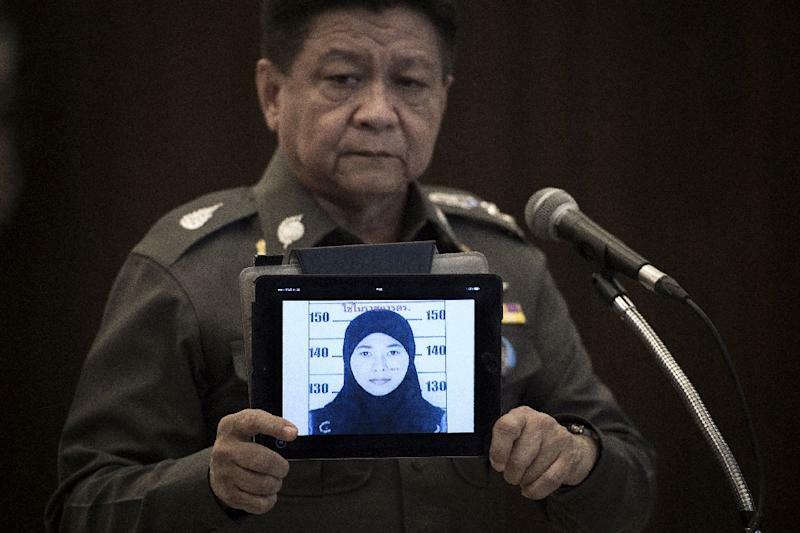 In a televised broadcast Prawut displayed a photograph of the wanted Thai woman taken from an official identity card, showing her wearing a black headscarf. 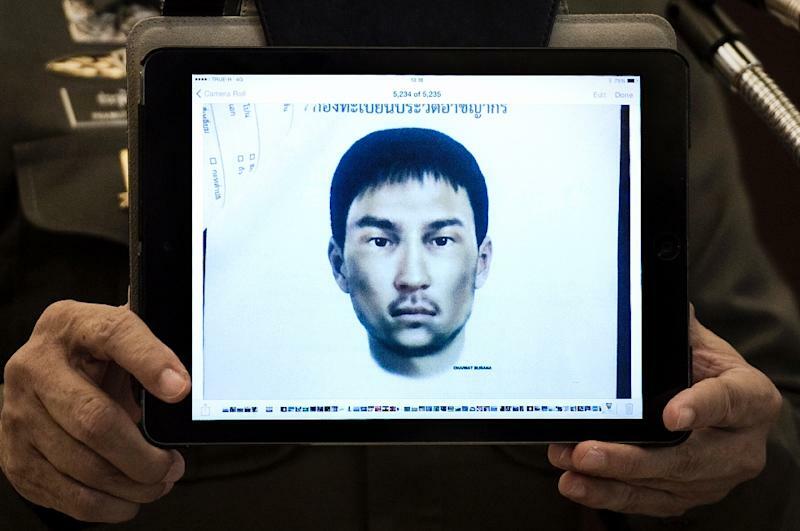 He said an arrest warrant had been issued for 26-year-old Wanna Suansan -- also known by the Muslim name Misaloh -- from the southern province of Phang Nga, the first time a suspect in the bombing probe has been identified. A sketch of an unidentified man with a moustache was also broadcast. Speaking to AFP by telephone, a woman who identified herself as Wanna said she was currently living in the central Turkish city of Kayseri with her husband and that she was last in Thailand three months ago. "I have not been to that apartment for almost one year now," she said, adding that she had sublet the flat to a friend of her husband's. The woman, whose identity AFP could not further confirm, said she was horrified to learn via a Thai friend she had been named as a suspect. "I was very shocked and thought my friend was joking with me," she said, adding she had been in contact with Thai police and was happy to cooperate with investigators. Thai police refused to confirm or deny whether they believe Wanna is in Turkey. No group has claimed responsibility for the attack, allowing speculation to fill the information gap -- with the ruling junta and police at times appearing to contradict each other. Authorities have been at pains to play down any suggestion the attack was launched by international terrorists or targeted Chinese visitors, in a nation where tourism represents nearly 10 percent of the economy. In July, Thailand deported 109 Uighurs to China, enraging supporters of the minority who allege they face torture and repression back home. Turkish protesters stormed the Thai consulate in Istanbul and forced it to close at the time. Police have said the only suspect in custody, whom pictures showed was thin with heavy stubble, was part of a crime group who helped illegal migrants obtain counterfeit documents -- and that the attack on the shrine was retaliation for a crackdown on their lucrative trade. Asked if the detainee was linked with smuggling Uighur migrants to Thailand, junta leader Prayut Chan-O-Cha refused to rule out the theory. "Everything is partly involved," he told reporters in a typically cryptic answer. But some analysts have poured cold water on the idea of crime gangs going to such extremes of violence. "If it was linked to organised crime, where's the profit motive? How does killing 20 innocent civilians help your business?" Zachary Abuza, an expert on Southeast Asian militant groups, told AFP. The junta, which has pegged its legitimacy to upholding security and reviving the flagging economy, may have pushed the police into "unsubstantiated hypotheses", Abuza added. Police have also said they were working with "several embassies" to try to ascertain the identity of the detained foreigner, who is being held in military custody. Officials initially said he was not cooperating with his interrogators as they brought in multiple translators, including an English speaker. But on Monday police chief Somyot Poompanmoung told reporters the suspect's interrogation had yielded "very useful" information.